I bought a giant stock watering tank today! I was tempted by the 300 gallon tank they had at Amherst Farmers Supply, but I settled for this one. Back on July 16th I pulled the flax at Amethyst Farm. It was the last plot I harvested, and ideally I should have pulled it about a week earlier, judging by how many stalks were totally brown and dry by the time I got around to it. We had some extremely hot weather that put those poor plants right over the edge. But you do what you can do. Here’s the Evelin seen from the south side of the plot. Supposedly this blog is about dyeing. Even though I don’t seem to write about it very often, I do sometimes actually dye things. 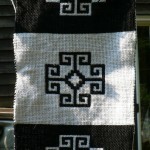 This week I had great success with woolen yarns using Queen Anne’s Lace flowers. Plus I managed a successful woad vat, aerated and everything. 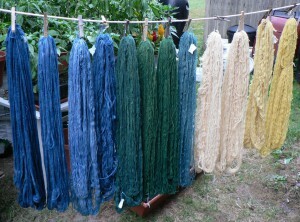 Here are the lovely yellows, greens, and blues hanging on the line to dry in the back yard (each skein is about 4 ounces). In the last post I forgot to show these images of a particularly robust v.n.s. plant. 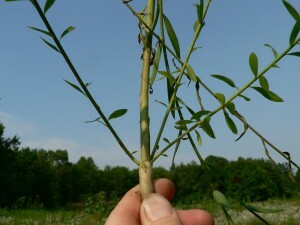 The thicker stalks tend to be around the edges of the plot. This is one of the reasons, I imagine, that people usually recommend against planting in row. If you have a continuous plot, you have less edge-area relative to your total square feet. However, I can’t reach in to weed anything wider than 4 feet. 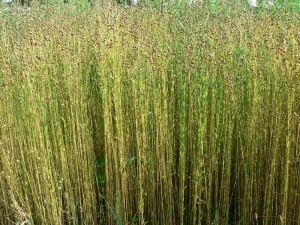 If you don’t weed, in my experience, the weeds overwhelm the flax. However, you can see several undesirable characteristics here from a fiber point of view. For one thing, it’s a very thick stalk. 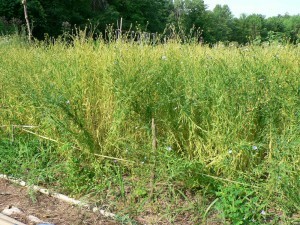 On Friday July 13th and Sunday July 15th I harvested the flax at our community garden plot at Amethyst Brook. It took two days because there were a lot more plants in these plots, and because the v.n.s. and the Marilyn had such a problem with lodging that they were a mess to sort out and bundle up. Here’s the v.n.s. looking toppled after it got knocked down three times or so, and I tried to encourage it back to a more upright habit. But once it went down, it was down. The other day I very excitedly set about my first woad vat of the summer. 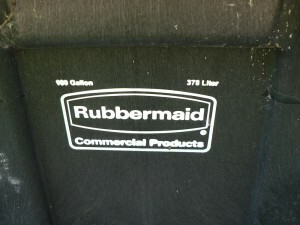 There were lots of supplies and equipment to assemble, dirty 5 gallon buckets to wash, yarns to soak. 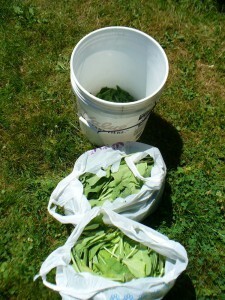 I got everything ready, and harvested seven and a half pounds of leaves from my glorious woad beds. You can tell from the title of my post that I made a big mistake along the way, but I hope to turn it into a learning opportunity for others, so I relate the tale…. Here are the bags of leaves. They were very clean because we have had practically no rain. Sometimes the leaves are muddy so I rinse them off, but not this time. 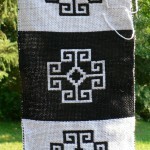 Doubleweave pick-up is a way to weave a reversible pattern by manually picking up the threads from the bottom layer and bringing them to the top. In those same areas, the threads from the top layer show up on the bottom. Before I go any further, here are the two sides of my sample so you can picture the end result as I describe the process.